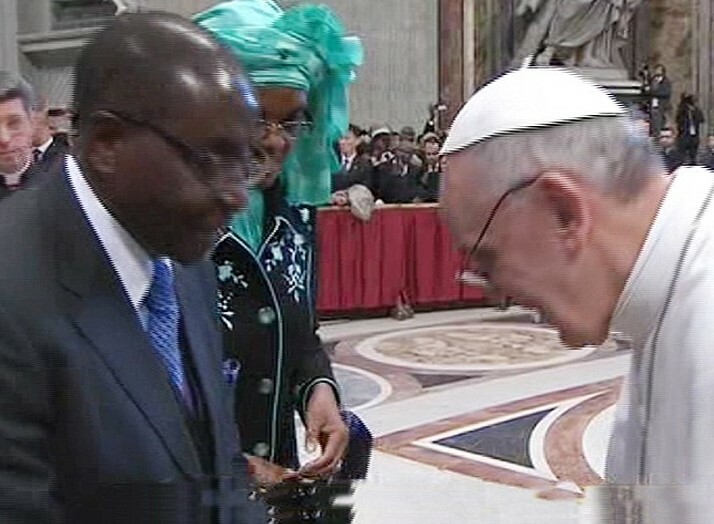 The pro-Marxist position of the brand-new Roman pope was shown on his first official day as pope of Rome, when he met President Robert Mugabe of Zimbabwe, shook his hand – and even bowed his head to him in greeting! Mugabe had been permitted to travel to the Vatican for the inauguration of Francis, defying an EU travel ban on the Marxist monster who has destroyed his country. The Vatican placed Mugabe in the VIP section at the inaugural mass. Just a slip? Not likely, when one knows that Robert Mugabe was educated by the Jesuits in Zimbabwe, and still considers himself to be a Roman Catholic! It was then surely the greeting of a Jesuit to a man who, despite all his abominable crimes, has nevertheless carried out certain Jesuit objectives in Zimbabwe. Once he became pope, Bergoglio began to raise his voice in support of economic and “social justice” Marxism. The evidence mounted up rapidly. Within weeks of his inauguration he criticised Capitalism and called for global financial changes along Communist lines! He said, “Unbridled Capitalism has taught the logic of profit at any cost, of giving in order to receive, of exploitation without looking at the person.” The results of such attitudes “we see in the crisis we are now living through.” This of course is false: the present crisis in the world is not the fault of free market policies, but of the Marxist policies so dear to so much of the world in recent decades. Addressing diplomats, Francis called for global financial reform that assists the poor, promotes the “common good”, and allows states to regulate markets. All typical Marxist phrases. His words were that economic inequality is caused by “ideologies which uphold the absolute autonomy of markets and financial speculation, and thus deny the right of control to states, which are themselves charged with providing for the common good.” Actually, this is not the duty of states at all, and any form of State regulation is deadly to the true creation of wealth, which only happens when individuals are free from State interference. “The common good” – how Communists love to prattle on about this! When a pope of Rome is praised highly by the secretary general of the United Nations – that diabolical one-world, pro-Marxist organisation – then we can be sure of Francis’ Marxist leanings! This is precisely what happened on April 9, 2013, when UN secretary general Ban Ki-moon met the new pope in the Vatican and said afterwards that Francis was “a man of peace and purpose” whose choice of the name “Francis” (after Francis of Assisi) was a “powerful image for the many goals and purposes shared by the United Nations.” Oh, this pope of Rome is a one-worlder all right. Ban went on to say that Francis “speaks loudly of his commitment to the poor”, and that the two men “discussed the need to advance social justice and accelerate work to meet with the Millennium Development Goals. This is vital if we are to meet the Millennium promise to the world’s poorest.” Any doubts left, dear reader? Lastly, Ban called Francis “a voice for the voiceless” and invited him to the UN. Francis continued to return to Marxist economic themes, slamming the free market but speaking highly of Marxist doctrine. In July 2013, for example, he completed a papal encyclical begun by his predecessor, Benedict XVI, and in this Francis called for an overhaul of the financial system and warned that unequal distribution of wealth leads to violence – a very typical Marxist analysis of violence. Then, in November 2013 he again returned to such themes, attacking Capitalism and speaking in favour of Marxist policies. In a lengthy document known as an “apostolic exhortation”, he attacked unfettered Capitalism, calling it “a new tyranny”, and called on world leaders to fight poverty and growing inequality. The words he used were that they needed to “attack the structural causes of inequality” and strive to provide work, health care and education to all citizens. When Papists, particularly Jesuits, speak of “structural causes of inequality”, they are speaking according to the doctrine of liberation theology, which teaches that “sin” is to be found within the structures of society. This is nothing but religious Communism! Nor is it the duty of governments to provide the citizens of the countries they govern with work, health care or education – this kind of Big Brother control, this overbearing State regulation of all aspects of life, is pure Communism. But the Lord never gave such tasks to governments. According to Romans 13 and elsewhere in Scripture, governments are there to maintain law and order. This is the limitation, biblically, on government authority. Providing jobs, health care and education is not their duty. But Francis went even further, harping on about the “social justice” Marxism he so loves. He called on rich people to share their wealth. The “redistribution of wealth” (read theft from the rich to support the poor) is at the very heart of Communism, and always has been. Note how Francis, in true Jesuitical style, keeps mum about the Vatican’s own vast global wealth, greater than that of any Muslim sheikh sitting on some desert oil well. Quick to call on the wealthy to redistribute their wealth, he does not declare that the Romish religion, the richest institution on the face of the earth, will be “redistributing” its wealth to the poor anytime soon. Do not be fooled by this pope’s pretence at humility and personal poverty, living in an apartment and cooking his own supper. It is all a Jesuit act. He is a hypocrite of the first order.